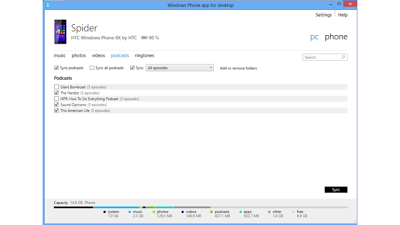 Syncing Windows Phone with Desktop has become that much easier with Microsoft announcing a new update for its Windows Phone app for the desktop. 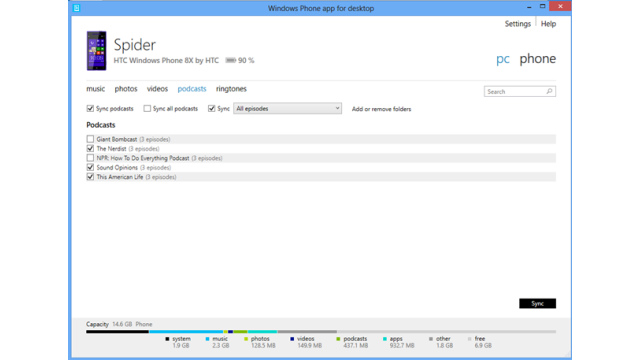 With the new update, the Windows Phone user can experience good desktop experience. One of the things Microsoft has done is upgraded the podcast support the software used to offer. Now the users can get their podcasts from different sources. With the App you can automatically sync with podcasts that are saved in a specific folder on your desktop and vice versa. Now with the update, the software allows you to sync audio files that may be anywhere on your computer including external hard drives. • Automatically import pictures and videos you've taken with your phone to your PC. • See at a glance how much space you're using for each type of content, so it's easy to make sure you never run out of room on your phone. The only problem with the software is that it just supports Windows Phone 8, lack of support for Windows XP and the disability to search the Windows Phone store from the App itself. However regardless of these snitches, this update is a worthy one for Windows Phone 8 users. You will need a PC with a Windows 7/8 installed and a Windows Phone 8. Download the update here and make full use of it.